A new design for our analysis reports is being developed and rolled out in the months to come. Some of you have already seen the beta version. To further improve how our reports can help you as an educator, we’ve been working on a brand new user interface. More or less all the features you’re used to are still there, but they might look different. Don’t hesitate to try it out as it’s easy to switch back to the interface you’re used to. We have listened to our users and are working hard at making the look of Urkund easier to work with. Our goal is less time spent for you sifting through reports and more time taking actions on your insights. For example, we’ve collected the main findings in a quick and easy overview with visual aids helping you identify findings that need closer examination. Much like earlier you get detailed views for each finding side-by-side, can drill into the specific sources matched, or scroll through the full document with findings highlighted. 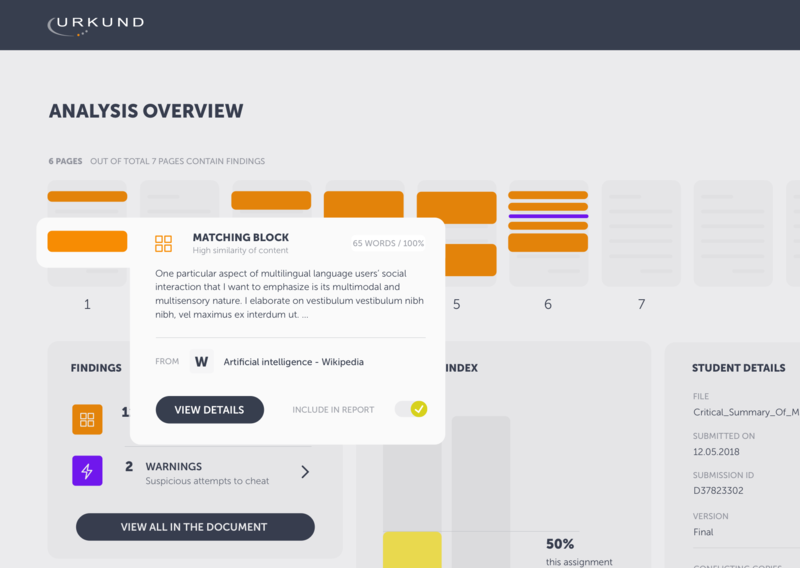 A new feature, and a personal favourite, is our friendly robot – named Urkbot – providing you with document specific tips helping you interpret the analysis result. Maybe you have already been able to try the beta out. If not, reach out to us and we’ll make sure to tell you all about it and how you can get access.